Burma (Myanmar) offers some fascinating night diving. 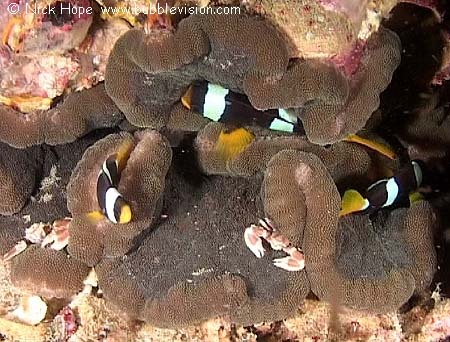 Here we see Clark's anemonefish (Amphiprion clarkii) and 2 tiny anemone crabs (Neopetrolisthes maculatus) hosted by a adhesive anemone (Cryptodendrum adhaesivum) at Moving Wall. My DVD features many night dives in Myanmar (Burma).